Well Google and Yahoo have been getting close lately. Who would have saw that coming? 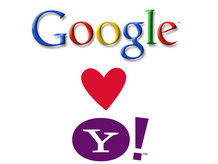 Google hearts Yahoo and Yahoo hearts Google. (Image courtesy of http://mos.techradar.com/images). Yahoo stated that "the nonexclusive pact" with Google will enable Yahoo to run Google ads alongside its search results and on some of its Web properties in the U.S. and Canada. The deal could be worth as much as $800 million per year for Yahoo. The question becomes was this deal in the works before the whole Microsoft-Yahoo soap opera earlier this spring? Is this a last ditch effort by Yahoo to remain independent as a search engine? (Google has stated that the World needs Yahoo and that independent competition will be of value to everyone.) Is this simply a move by Jerry Yang to please the shareholders before August 1? The answer could be all of the above, or it may be none of the above. it does not signal that Yahoo! plans to exit paid search. Quite the contrary. Through the financial benefits of better monetizing our search traffic, we’ll be investing in search services and ad platforms, including Panama. An independent search business is critical to our future. this deal is good for competition. It may seem counterintuitive that doing a deal with a competitor would improve our competitive position. But as search and display continue their convergence, it puts Yahoo! in a better position to innovate and compete aggressively with Google and others for ad dollars. Interesting thoughts. I like Jerry Yang and I would hate for Yahoo to go down without a fight. I for one would like to give Mr. Yang the benefit of the doubt. Do not forget that Yahoo is the #2 player in Search, not Microsoft, not AOL, not ASK. While they have a small fraction of the market when compared to industry leader Google, Yahoo has the drive and the passion to improve and to gain market share, something that neither ASK nor Microsoft has been able to do. Update: Tech Crunch posted a very in-depth piece on the deal between Yahoo and Google that can be found here.